FBTBForums.net :: View topic - The Heroic Adventures of Rick Chipmunk, Space Adventurer!!1! 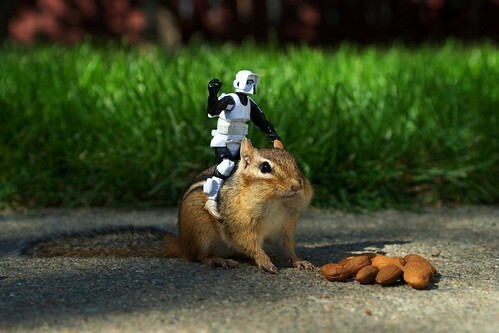 Posted: Wed Oct 15, 2008 11:43 am Post subject: The Heroic Adventures of Rick Chipmunk, Space Adventurer!!1! Oh Mah Gawds, the cuteness is overwhelming. Somehow I doubt thats a wild chipmunk. Awesome. I find this more compelling than the new TV series. I was always curious what the Scout Troopers used to get around after the Rebels destroyed all their At-st's and their main base on Endor.